As a result of Jefferson Lab staff, users and subcontractors' dedication and attention to safety, Jefferson Science Associates/Jefferson Lab recently earned two awards from the National Safety Council. 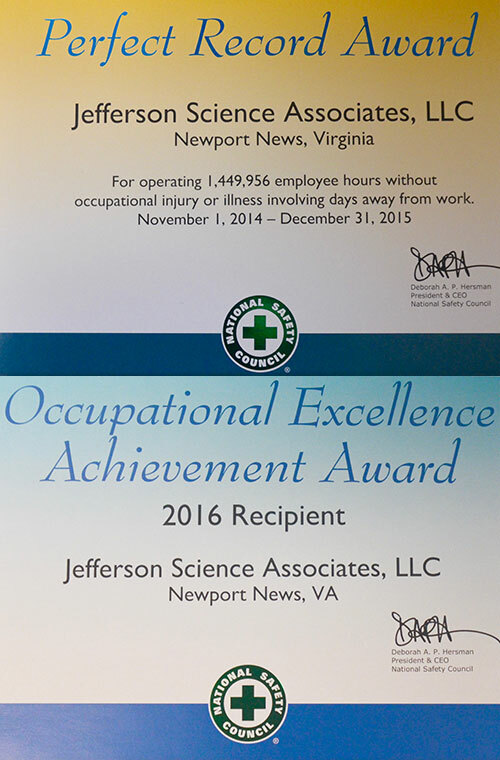 In addition, the lab earned the National Safety Council's Occupational Excellence Achievement Award. This award recognizes companies that have experienced injuries and illnesses that involved days away from work, at a rate “equal to or less than” the 50th percentile of the Bureau of Labor Statistics rate for similar industries. The lab achieved the nearly 1.5 million safe-hours-worked during a very busy period, according to Mary Logue, associate director for Environment, Safety, Health and Quality. Efforts included major commissioning work on the upgraded Continuous Electron Beam Accelerator Facility, delivering the first 12 GeV electrons to the new Hall D complex, carrying out major detector installation work in Halls B and C, and systems commissioning in Hall D. Also during this period, three separate utilities infrastructure modernization projects were underway: installing new fiber optic cable across the lab, installing a new cooling system for the data center, and upgrading the cryomodule test facility refrigeration plant at the Test Lab. Over the last several years, the lab has done a great deal to improve work planning, to make safety information and guidelines clear, and to keep the lab community informed and aware of changing work conditions and evolving safety issues, according to Logue. She also applauded the efforts of the ESH&Q staff and the many others at the lab that carry out important safety tasks, such as the Safety Wardens and Subcontracting Officer Technical Representatives. The lab assigns a Safety Warden to each building or specialized work area. That’s nearly 70 people who are keeping a careful eye, making sure safety guidelines are properly followed, Logue noted. The wardens are an “extremely valuable part of the program,” she said. The Subcontracting Officer Technical Representatives, or SOTRs, provide oversight of the lab’s many contractors and provide support when necessary. "But, we mustn't allow ourselves to become complacent or get hurried and ignore or forget our sound safety practices," she cautioned. "Summer is a time when we all look forward to some fun and relaxation, but that doesn't mean we can leave our safety guard down. "The only way to prevent injuries is for each of us to remain dedicated to planning our work and identifying and mitigating the hazards in the workplace – for ourselves and our co-workers." Jefferson Lab is a world-leading nuclear physics research laboratory devoted to the study of the building blocks of matter inside the atom's nucleus – quarks and gluons – that make up 99 percent of the mass of our visible universe. Jefferson Science Associates, LLC, a joint venture of the Southeastern Universities Research Association, Inc. and PAE Applied Technologies, manages and operates the facility for the U.S. Department of Energy's Office of Science. The National Safety Council is a non-profit, membership organization committed to preventing injuries and deaths at work, on the roads and in homes and communities. It engages organizations and individuals in research, education and advocacy and is a primary national resource on industry trends.